Description: Being a strain of plate wyrm residing in the dark reaches of the Paramina Rift, having evolved a feathered covering to protect against the harsh cold. Its smooth, metallic carapace is coated in an oily secretion which prevents snow from adhering to its surface. 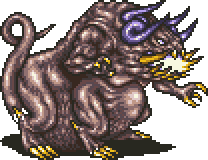 According to legend, mages once used these creatures in the working of a great magick, powerful enough to destroy all Ivalice, yet little is recorded about the magick itself.